DIY - Luck of the Draw fundraiser! piece of art on paper no larger than 9” x 12”. 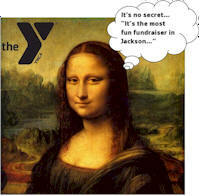 The art is signed on the back and displayed on the Big Wall of Art at the YMCA for the event. The most fun part of the event is not knowing who the artist is until after their work has been chosen. Event-goers will purchase a “draw” ticket for $100 and are guaranteed a one-of-a-kind piece of art. As numbers are drawn at random, ticket holders have 30 seconds after their number is called to pick their choice of art from the Big Wall of Art. Admission tickets are $50 and include food, drinks, door prizes, a silent auction and a chance to watch the evening’s primary entertainment, the ‘Luck of the Draw’ art drawdown.